MVRDV – Almere Oosterwold – MVRDV proposes this development strategy for Almere Oosterwold, titled ‘Estate for Initiatives’ a Dutch urban planning scheme that steps away from governmental dictate and invites organic urban growth where inhabitants create their own neighbourhoods including public green, urban agriculture and roads. Is DIY urbanism possible? 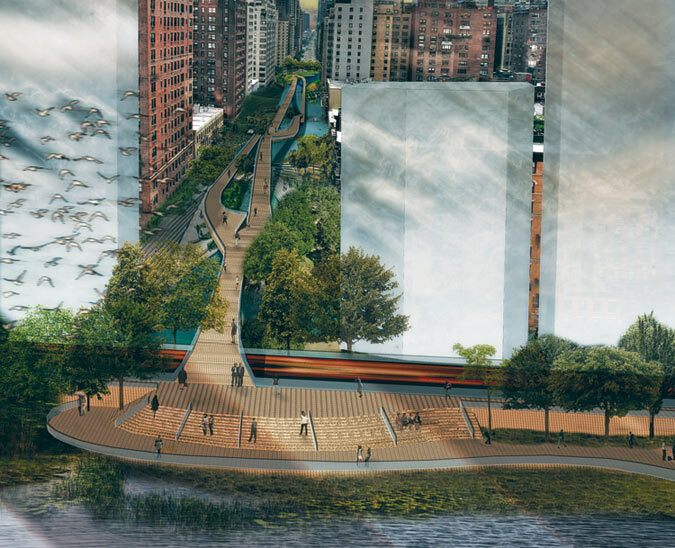 Up the river – Read Archpaper’s review of the winners of Civitas’ Reimagining the Waterfront competition, which address the crumbling East River Esplanade from 60th to 125th streets in New York City and crucial aspects of waterfront regeneration. Rethinking the Automobile (with Mark Gorton) – This Streetfilms video takes us through a presentation by Mark Gorton that exposes how automobile traffic has decreased our quality of life, and how to recover it. 72 Hour Urban Action Stuttgart 2012 Open Call – The world’s first real-time architecture competition is now underway! Submissions are accepted until the 26th of May and the event will take place, this time in Stuttgart, Germany, from 11-14 of July 2012. 10 Urban Infrastructure Regeneration Projects – In case you missed it, have a look at our latest case study roundup, featuring before and after shots of transformed infrastructures such as highways or railroads into public parks, transit systems and civic spaces.